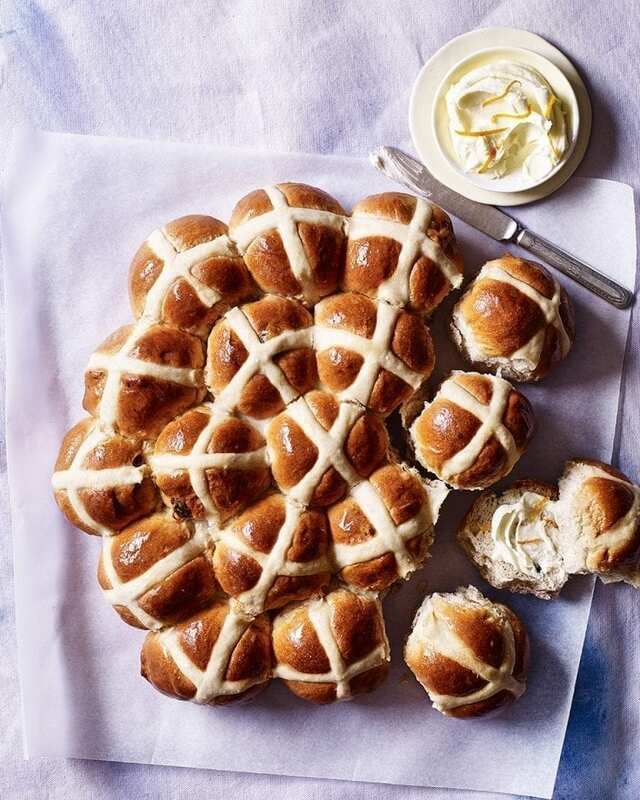 It wouldn’t be Easter without hot cross buns. We’ve taken them to the next level by serving them family-style with a boozy marmalade whipped butter – there’s no going back now. Sift 750g of the flour into a large glass or ceramic bowl. Rub in the butter with your fingertips until it resembles breadcrumbs. Stir in 45g caster sugar, salt, cinnamon, allspice, nutmeg and yeast. Mix in the beaten egg with 375ml milk, until you have a soft, pliable dough. Tip the dough out onto a lightly floured surface and knead for 15 minutes, or in a stand mixer for 10 minutes until smooth and elastic. Put the dough in a large, lightly greased mixing bowl, cover loosely with oiled cling film and leave in a warm place for 1 hour, or until doubled in size. Tip the dough onto a lightly floured surface and knead well to knock out all the air, then work in the raisins and mixed peel. Cut the dough into 17 equal pieces. Lightly flour your hands and place slightly cupped, with fingers open – over each piece, then rotate your hand in a circular motion, pressing down on the dough to create a neat ball of dough. Repeat with the rest of the dough. Arrange the balls into a spiral on a lightly greased baking sheet. Cover with oiled cling film and leave in a warm place to prove for 30 minutes. Heat the oven to 200C/180C fan/gas 6. Sift the remaining flour into a bowl and stir in 150ml water to make a smooth wet paste. Spoon into a freezer bag, snip off the corner and pipe a cross over the top of each bun. Bake for 25 minutes until golden, covering with foil if they brown very quickly. Meanwhile, put the extra 4tbsp milk and extra 2tbsp sugar into a pan. Heat gently to dissolve the sugar, then boil for 2-3 minutes until syrupy. Brush the glaze over the warm buns. Transfer to a wire rack to cool. To make the whipped butter, cream together the butter and orange zest and 175g of the icing sugar until light and fluffy (in a food processor or with a hand held whisk). Beat in another 175g sifted icing sugar and the marmalade vodka. Serve with the buns. You can use any dried fruit you like, roughly chopped glacé cherries or finely chopped dried apricots work well. The buns are best served fresh but you can reheat them the next day in a low oven, or toast them the day after that. The butter can be made (or leftover can be saved) for up to 2 weeks, in a sealed container in the fridge.